====Goals: sports fields with natural turf (stratigraphy for diffuse heat exchange, using water and gravel, for large settlements, cultural, industrial and logistics); ====Usable in: football, rugby, tennis, hockey, ..., roads and their hydrogeological asset, industrial and airport logistics, factories and shopping centers, intensive agronomy in open spaces and greenhouses ====All IP set: Link . ====An irrigation, draining and/or heating system of a surface, comprising: a tank (215) defined by a water-proofing sheath (214) housed in an excavation in the ground; a water grid (201) located inside said tank (215), comprising at least one inlet module (202) and at least one outlet module (203); an outer water reservoir; one or more inlet (260) and outlet (261) connections, connecting said water grid (201) to said outer water reservoir; and a draining soil to fill said tank; wherein each of said at least two modules comprises an impermeable main pipe (204) from which a series of permeable conduits (205) emerges, where said conduits lie on the same horizontal plane of said main pipe. And a method for heating a surface. 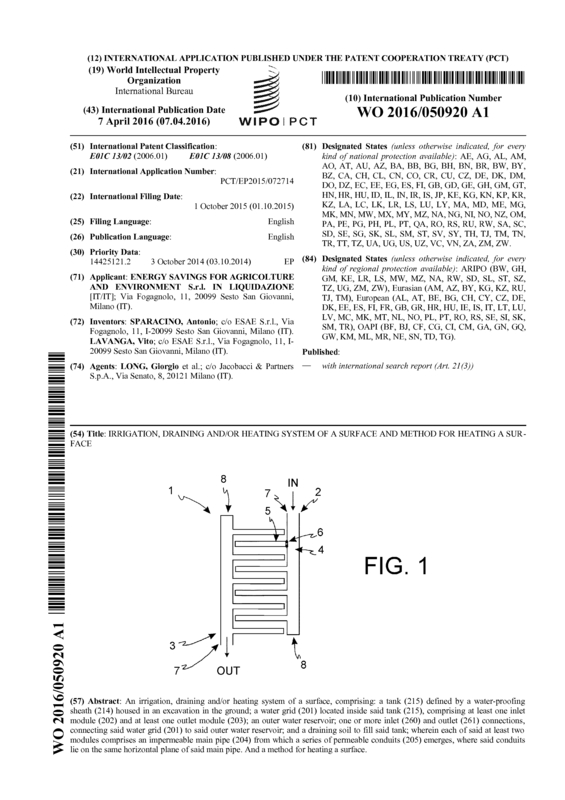 Page created at 2019-04-21 18:28:03, Patent Auction Time.